President Trump is proving to be far more noble than expected working toward conservative goals, though his crude manner is driving leftist haters to madness. As they struggle desperately to smear him as unhinged, unstable, and unworthy, they reveal themselves as unhinged, unstable haters of America who are unworthy of our trust. They strive to portray him as uncaring and without empathy during the flood in Texas, but a man is not so loved by his friends and family if he has no heart as they claim. I stopped believing most of what the media said in the 1980s when it became obvious their intention was to not only discredit everything Ronald Reagan said, but to undo all of the good he did for the country. Americans enjoyed an economic revival thanks to Reagan, and the Iron Curtain came down due to his words and actions. But if you listen to leftists today they rewrite history to cast America in a great depression inflicting evil on the world. Democrats are smearing President Trump for his pardon of Sheriff Joe Arpaio who was railroaded by a leftist judge because he upheld American immigration law. The judge deemed his actions “racist” and he was stripped of his job and threatened with jail for acting righteously. Liberals do not want America to be a nation of laws, but a nation of pagans under their control. This is exemplified by their chant, “No Trump, no wall, no USA at all!” These are not America patriots or righteous people fighting against oppression. They are insurgents fighting for the overthrow of America and enlisting foreign assistance to do so. Not only do Democrats hope to profit off of allowing illegals entry into America, but they want to profit by giving them the vote over citizens. They want that power so they can tax and steal taxpayer’s wealth for themselves and dole it out to their friends and supporters. At the same time they want Trump to divest himself of all his business holdings to avoid the “appearance” of impropriety they are scamming the people. Congressional Democrats went beyond making insider trading legal for themselves to make racketeering a right for themselves. Not only do they know in advance what companies are going to profit, they make certain they profit by guaranteeing them government subsidies. Solyndra and others like it were nothing more than a money laundering scheme for the DNC. Leftist Democrats want Americans to believe that Donald Trump doesn’t have all his marbles, that he is “unhinged,” “deluded,” “mentally incompetent,” and their lies are becoming so obvious when they have round table discussion it’s a wonder they don’t poke each other’s eyes out with their Pinocchio noses. You have to wonder just how stupid do they believe people to be that they think they can convince everyone that a man can become a billionaire by being a nutjob? What is happening is these leftists are projecting their own mental state onto Trump and his supporters. It is they who have become unhinged. It is they who have become deranged in their wickedness. It is they who are mentally unstable in their rage. The reason that Obama’s army Antifa is invading every Trump rally is to silence free speech through violence. It is the same people going from city to city, especially Democrat cities where Democrat mayors will sit on their hands, who are attending and disrupting these events. The KKK and neo-Nazis were not formed by Republicans, but are Democrat animals. That they face off at Trump rallies is not because they unite with Republicans who stand with them, but to give the Left their optics that Democrats are now the ones fighting racism. This is classic Hitlerism adopted by Obamaites. Democrats are the party of slavery, segregation, lynchings, and oppression. Why do Republicans allow them to perpetrate this fraud? When are the Trump Republicans going to put a stop to this?!? When will President Trump order AG Jeff Sessions to put a stop to these dissidents causing riots and destruction? Read it, and tell me you don’t recognize it today in America’s liberal media. Compare that with one of their top stories about Donald Trump stating that he hired hookers in Russia to pee on the bed slept in by the Obamas. That story was proven to have been manufactured by Obama’s CIA chief to present to Trump as proof he needed protection from false accusations. But the liberal media will never report that it’s fictional. Instead they present it as proof that Trump is deranged. And liberals are duped into believing it without question because militarized propaganda warps their ability to think rationally. Simply put, combat special propaganda turns a human into a zombie not only actively supporting the settings embedded in his or her mind but also aggressively opposing those who hold other views or try to change his mind, using logical arguments. It can’t work any other way, in fact. 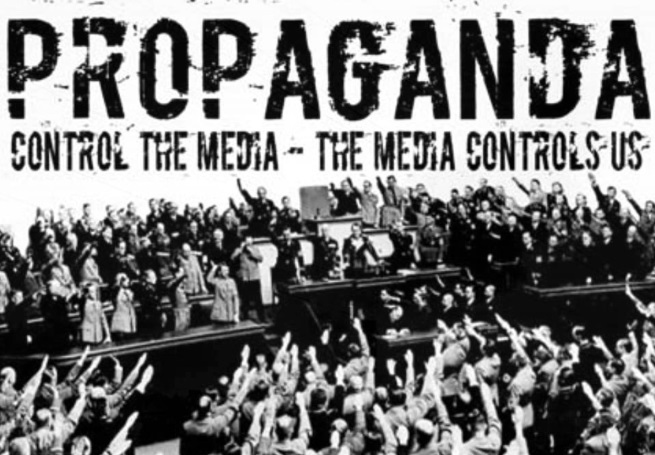 All methods of special propaganda are united by a common goal: to weaken the enemy by planting discord, mutual hatred, and distrust into its ranks. Today, these methods are used against us. You know these methods and techniques, too. You just don’t realize it, and you are not supposed to. So nothing the leftwing media says can be believed. Their panels are a bunch of Pinocchios trying to outdo each other’s lies and condemnations of Trump’s existence. Doubtless this is coming as a shock to him, but as he demonstrated after he tried to mollify the press after they accused him of not condemning the neo-Nazis in Charlottesville severely enough, he will not tolerate their duplicity. They all reported that he said “there were bad people on all sides” when there clearly were not. The good people were his supporters, Republicans, conservatives, Christians, and the TEA Party. The KKK, neo-Nazis, Antifa fascists, and BLM criminals were not the good people to whom Trump referred when he said, “there were bad people on multiple sides.” The leftist groups were all the bad people who all took their own side and the Democrat media blamed the Republicans for what their radical agitators did. Unfortunately, there is also reason to fear Donald Trump is not up to speed on Islam and Antifa as evidenced by his administration officials like Cohn, Tillerson, and McMasters. Losing Bannon and Gorka was not in the best interests of America’s future, and retaining these fools who believe Obamaism when it comes to Islamo-Nazis and liberal fascists is a recipe for disaster. This entry was posted in Politics and tagged American Nazis, Antifa, Democrats, Donald Trump, Fake News, KKK, Obama's Army, Racism. Bookmark the permalink.